Whether you are getting ready to take a trip or just dreaming about one, here is some information that might make planning your vacation a whole lot easier. Welcome to the Travel Information Page! Inspired by Jules Verne's classic adventure tale, Mike Veseth takes his readers Around the World in Eighty Wines. The journey starts in London, Phileas Fogg's home base, and follows Fogg's itinerary to France and Italy before veering off in search of compelling wine stories in Syria, Georgia, and Lebanon. In the middle of a yearlong backpacking trip around the world with his wife, Cassie, Oren Liebermann is teaching English to young Buddhist monks in Pokhara, Nepal when his body begins to fail him. He is constantly thirsty and exhausted, and by the time he steps on a scale, he has lost forty-five pounds. At a local clinic, a doctor gives him a diagnosis that will change his life forever: "I'm sorry to tell you, my friend, that you are a diabetic. Bucket List Adventures is not only a practical travel book sharing detailed information on lodging, helpful resources, etc. but also an inspiration for people to step out of their comfort zones. When Miss Norma was diagnosed with uterine cancer, she decided not to confine herself to a hospital bed for what could be her last stay. At ninety years old she took off on a cross-country journey with three professional nomads: her retired son Tim, his wife Ramie, and their standard poodle Ringo. In their thirty-six-foot RV this once timid woman said 'yes' to living in the face of death, found her health improving, and strengthened bonds with her family and with strangers who welcomed them with kindness and open hearts. The stirring account of a monthlong journey on foot through the French Alps. Journeying from sleepy barrios to glamourous cities to Mayan ruins lying unexcavated in the wilderness, Wood forges new relationships along the way that stand at the heart of this book--and the personal histories, cultures, and popular legends he discovers paint a riveting history of Mexico and Central America. This is the remarkable true story of how love and courage led PK to overcome extreme poverty, caste prejudice and adversity--as well as a 7,000-mile, adventure-filled journey across continents and cultures--to be with the woman he loved. Wide-Open World follows the Marshall family as they volunteer their way around the globe, living in a monkey sanctuary in Costa Rica, teaching English in rural Thailand, and caring for orphans in India. There's a name for this kind of endeavor--voluntourism--and it might just be the future of travel. After two and a half years as NPR's Moscow bureau chief, David Greene travels across the country--a 6,000-mile journey by rail, from Moscow to the Pacific port of Vladivostok--to speak with ordinary Russians about how their lives have changed in the post-Soviet years. 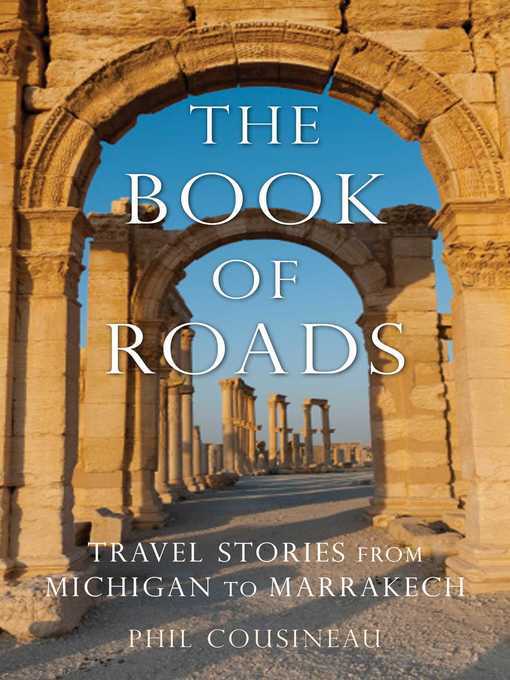 In Around the World in 50 Years, Podell recounts the misunderstandings, detours, accidents, breakdowns, robberies, and even wars that he needed to overcome to visit every corner of Earth. Search our databases to locate magazine and journal articles about travel. The New Handbook of Texas is a multidisciplinary encyclopedia of Texas history, geography, and culture. The scope is broad and inclusive, designed to provide readers with concise, authoritative, and accessible articles that provide factual, nonpartisan accounts on virtually every aspect of Texas history and culture. MasterFILE Premier brings together a large collection of magazines and journals, including many that deal with travel. For best results, use the terms "TRAVEL" and "TOURISM" in your searches. Is there a vacation in your future? through books, eBooks, or online resources. Live vicariously with our selection of armchair travel. Take a moment to check out some helpful online resources. Check the local time at locations all over the world, find the best times to call between different countries, and even check the current weather. This United Nations agency is responsible for the promotion of responsible, sustainable and universally accessible tourism. Explore trip information using Google Flights. Kayak is a travel "meta search" engine, which searches hundreds of travel sites from all over the world to compare airfare, hotels and more. An interactive web site that displays flight information from around the United States and is searchable by both flight and destination. Live flight tracking and other interesting flight information. Worldwide plug and socket information. FXConverter is a multilingual currency converter for calculating the exchange rate of over a 150 different currencies. It uses daily OANDA Rates®, the touchstone foreign exchange rates used by corporations, tax authorities, auditing firms, and financial institutions. These filtered rates are based on information supplied by leading market data contributors. The calling chart below will help you find the dialing codes you need to make long distance phone calls to friends, family, and business partners around the globe. Translate words, text, web pages and more with Google's free language tools. Complete travel health information for both Doctors and Travelers -- updated daily. The mission of the Bureau of Consular Affairs (CA) is to protect the lives and interests of American citizens abroad and to strengthen the security of United States borders through the vigilant adjudication of visas and passports. CA contributes significantly to the USG goal of promoting international exchange and understanding. Our vision is to help American citizens engage the world. The Bureau issues the travel documents that allow Americans to travel the globe and lawful immigrants and visitors to travel to America and provides essential cycle of life services to American citizens overseas. Promotes travel and tourism to Texas through articles and photography. Click across Texas with Texas Traveler by Texas Monthly Magazine. Frommers.com brings you cheap airfares, bargain rate cruises, discounted hotel rooms, budget car rentals and money-saving advice. Travel guides and guidebooks. Travel advice, tips and destination information to inspire you. Get trusted restaurant ratings and reviews in your neighborhood at Zagat.com. Search our city guides by cuisines, features, and top rated restaurants. Explore Washington DC. Things to do. Places to stay. Places to eat. Events. Offers descriptions, road maps, itineraries, travel tips, costs, and contact information for national parks ranging from Maine's Acadia to Hawaii's Haleakalā. The fifth and latest edition of National Geographic Guide to Scenic Highways and Byways provides more than 300 possibilities for spectacular getaways in your local area and throughout the 50 states. Europe by Eurail has been the train traveler's one-stop source for visiting Europe's cities and countries by rail for more than forty years. This comprehensive guide provides the latest information on fares, schedules, and pass options, as well as detailed information on more than one hundred specific rail excursions. The book contains information readers need to enjoy visits in historic cities, romantic villages, and scenic hamlets on more than ninety rail trips starting from twenty-eight base cities located in twenty countries. Sample rail-tour itineraries combine several base cities and day excursions into fifteen-day rail-tour packages complete with hotel recommendations and sightseeing options. . Packed with practical information, step-by-step directions, advice on where to go and what to see and do, and complemented by the inclusion of twenty maps, Europe by Eurail takes the puzzle out of European Rail Travel. Both the Inside Passage of Alaska and the Gulf of Alaska are among the single most popular of all cruise destinations, and multitudes of cruisers will welcome this assistance in choosing a cruise and the activities on ship and land that the cruise offers. "All reviews are completely independent ... [includes]: reviews of 275 cruise ships; tips on getting the best value for money; details that the brochures don't include; internationally recognized ratings system; expert advice for solo travelers, honeymooners, seniors, families and the physically challenged; all about the cuisine and dining choices available; where to find the best spa and wellness facilities; comparing the major cruise lines; comparing the smaller cruise lines"
From helping to build a health clinic in Tanzania to learning massage in Thailand to aiding green turtle conservation in Belize, The 100 Best Worldwide Vacations to Enrich Your Life is full of fun, meaningful, and memorable possibilities for today's discerning traveler. Explore walking tours of the cities of these great artists: Van Gogh, Munch, Vermeer, Caravaggio and Goya. Fifty Places to Bike covers environments as varied as the Dalmatian Coast in Croatia, the Tour de Tuli through Botswana, and the urban jungle of New York City. With a healthy mix of international and national locations, the fifty chapters capture breathtaking vistas cyclists will enjoy around the world. Incorporating hundreds of first-hand accounts from people who have actually done the jobs as well as a clear, country-by-country guide to the opportunities available - from selling ice cream in Cape Town to working as a film extra in Bangkok – this working travel handbook reveals how to fund a trip of a lifetime by finding temporary work abroad both in advance and on the spot while traveling. Written for both veterans and novices of rail travel, it will make any trip run smoothly and enjoyably with insightful tips and information about how railroads operate. The book takes you to 520 fascinating train rides, museums, trolleys, dinner trains, and historic depots across the United States and Canada. Inside, you’ll find cross-country routes and road-tested advice for adventurers who want to see the parts of America that the interstates have left behind. Jensen also includes mile-by-mile highlights celebrating major cities, obscure towns, popular attractions, roadside curiosities (if you’re looking for the world’s largest jackalope, you’re in luck), local lore, and oddball trivia. As with all books in this series, the campgrounds selected for The Best in Tent Camping: Texas had to meet three criteria: they had to be accessible by car but not overrun with RVs; offer great scenery; and be as close as possible to a wilderness experience. Describing the exciting and adventurous world surrounding geocaching—a worldwide hunt in which treasures are located using global positioning system (GPS) devices—this manual offers an understanding and application of the principles and best practices of the sport as well as information on the different types of caches and competitions. The "10 Essentials" have long been recognized as the minimum amount of survival gear you should carry when heading into the backcountry. This book breaks down the gear options into what works, what doesn't, and why. An experienced long-distance backpacker shares advice on proper hiking equipment, covering clothing, footwear, shelters, and cooking systems, and outlines sample gear kits for different types of terrain. Plan a trip with your aging parents. Guide to traveling with your pet. Michael Wigge is on an adventure of a lifetime. The reporter and journalist has traveled to many countries before, but this time he decided to make it more challenging: he would travel twenty-five thousand miles around the world by foot, bus, train, ship, and plane and not spend any of his own money.